Will These Youth Protests Spread to Asia’s Corrupted Democracies? Several have many of the same hallmarks as those that have recently experienced unrest. The last few years have witnessed a wave of youth protest in developing countries, reaching even to developed states. Democracies, or regimes at least posturing nominally as democracies, have been the general target. It is unclear if these movements are cross-pollinating one another, but the similarity in both the profiles of the protestors and their grievances is suggestive. To date, Asia’s democracies have missed this wave, but it is worth noting that the protest profile could easily apply there too. 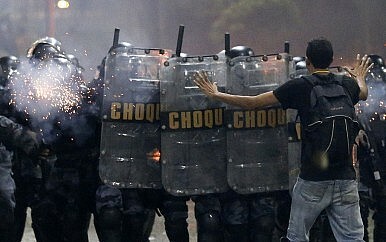 The youth riots in Brazil, Chile, the European Union, the Arab Middle East, Turkey, and even the “Occupy” movement in the West all reflect what political theory broadly calls the “legitimacy crisis” of modern democracy – the notion that participation in democratic politics does little to change the actual process of government, that elites are dug-in and immoveable, that cronyism is endemic, and so on. Young voters particularly become cynical of the formal electoral process, either dropping out in disdain, or expressing their grievances “extra-parliamentarily”, i.e., on the street. (For example, see this on Australia; or this on Brazil.) To be sure, the Arab Middle East’s pseudodemocracies are something of an exception. Protest there includes far more foundational or revolutionary grievances. But insofar the area’s “republics”, rather than monarchies, have been hit, that too is suggestive of the hopes raised by democratic forms, and then dashed in the minds of younger citizens by corruption and cronyism. Watching all these riots – particularly listening to articulate young people in Ankara, Rio, or Cairo – raises the question if this wave might spread to Asia’s similarly corrupted democracies. Asian states, too, have well-educated youth, exposed through modern technologies to the reality of better, cleaner governance elsewhere. And many of the problems these protests are identifying exist in spades in Asia: high-handed, out-of-touch governments; election-proof pseudo-technocracies that act as unaccountable oligarchies; shallow, clique-ish political parties that provide no meaningful transmission belt of citizen preferences; massive government and business corruption; wasteful white-elephant spending to capture global “prestige” while everyday services like health care and education are underfunded; closed political opportunity structures that regularly reward insiders and large corporations with crony connections to the state; wealthy, de-linking elites with 1% lifestyles wildly at variance with the rest of the population… That is not just Brazil, Turkey, Egypt, or the EU/Brussels. That is Asia too; there is more than enough sleaze to go around. Will this spread? Transition expert Jay Ulfelder and I had a lengthy Twitter conversation on this question in recent weeks (here & here; and here). Jay runs an excellent website on the causes and consequences of social unrest, modernization, and democratization, and participates in the path-breaking “Good Judgment Project”, which seeks to answers exactly these sorts of questions. (This short essay can only scratch the surface, but interested readers can actually participate in the Project as forecasters.) Jay asked which countries might this apply to in Asia. My first thoughts were India, the Philippines, and South Korea among the democracies (given the obvious problems street protests face in non-democracies). Are those countries really governed better than Brazil? I doubt it. India is infamous for its corruption, while simultaneously praised for its quality education. That contradictory combination practically guarantees disappointed youth lapsing into either apathy or street anger. India’s democracy is robust, but its political parties are poorly institutionalized, frequently rooted in ethnic and local affiliation, and prone to elite control – family control even, in the case of Congress. They are poor vehicles for the transmission of shifting policy preferences rather than tribal identities. And governance – the actual provision of services – in India is notorious, as the recent global attention on the poor police and state response to sexual violence has made clear. Indeed, one might argue that Anna Hazare’s anti-corruption campaign was a local analogue to the Occupy movement in the West and precursor to the recent events in Brazil and Turkey. The biggest scandal in South Korean history almost never made it to light.